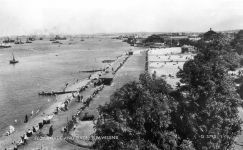 The Promenade is of comparatively recent construction. Until the late 1880s it was largely a stretch of saltings covered by high Spring tides nearly up to the wall surrounding the New Tavern Fort. At other times the area was a repository for seaweed and flotsam of all kinds. Advantage was taken of the sinking of a schooner called the ‘Spring’, loaded with bags of cement, to purchase the damaged cargo and use it to face an embankment, the ground behind being levelled to the required height. Some of the built up cement bags remained visible until 1978, when work to strengthen the sea wall was undertaken in connection with the Thames Barrage (flood defences). The Countess of Darnley opened the western section of the Promenade in August 1886. The ‘Spring’ was repaired, refloated and renamed the ‘Gravesend’. A bandstand was built in 1890 at a cost of £100 (demolished 1933). Further land was bought from the railway in 1902 and in 1906 shelters were built. 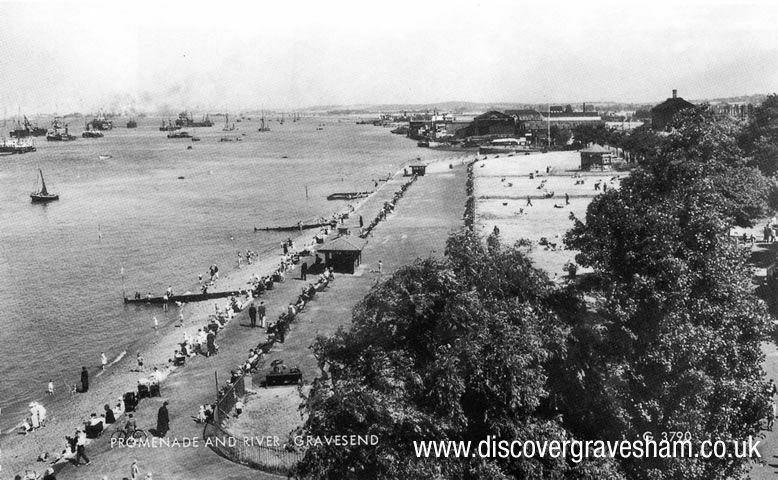 At the western end of the promenade are the boat sheds and clubhouse of Gravesend Rowing Club, established in 1878. At the eastern end of the promenade is the clubhouse of the Gravesend Sailing Club (founded in 1894 at the Rosherville Hotel and moving to this site in 1905) whose members use the Canal Basin for laying up and fitting out their craft.